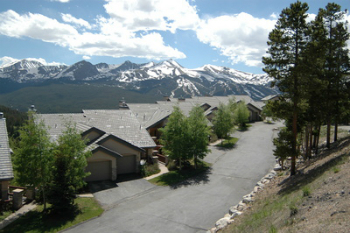 Charter Ridge townhomes for sale sit high on a ridge of Baldy Mountain, about 2 miles above Historic Downtown Breckenridge. A trip to town is less than 5 minutes by car, but seems miles away while enjoying the unobstructed view from these mountain townhouses. The free Summit Stage bus stop is less than a long block from the Charter Ridge townhomes for sale, and the trailhead that climbs up to treeline on Baldy Mountains is just beyond that stop. This trail is popular with cross-country skiers, hikers, mountains bikers and 4-wheelers and connects to a network of trails that lead to other parts of town. Learn more about living in these stellar homes, or browse the Charter Ridge townhouse listings found below. 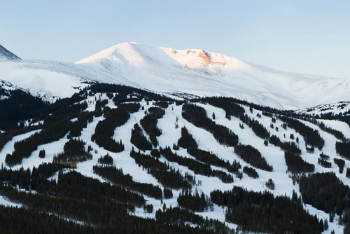 The large, geometric windows of Charter Ridge townhomes let in sunlight and open up panoramic views of the Tenmile Range and the Breckenridge Ski Resort. These linked, staggered townhomes were built just below the level of Baldy Mountain Road and connected to it by Charter Ridge Court. From this dedicated road, each home's driveway branches off and is neither long nor steep so are easy to maintain in winter. The front entrance shares the front façade with the garage, and their street view is like a low-profile ranch. From the opposite side from the drive, these town homes are deceptively tall - built to take advantage of the steep terrain in the Woodmoor neighborhood where Charter Ridge is located. Each of the homes has a garage and basement, and one – the first one built - has room for three-cars. Size: 2398 sq. ft. to 3708 sq. ft.
From Breckenridge, head south and take a left at the stoplight at Boreas Pass Road, continue up Boreas for about 1.5 miles. As it seems to level off, turn to the right on Baldy Road, Charter Ridge Townhomes will be a half mile up on the right. If you would like more information on living in Charter Ridge or if you would like to view available townhomes for sale, please contact Breckenridge Associates.